Gary Payton II making his own name, but is it The Mitten or The Thief? CORVALLIS, Ore.—Mom knows best, said Gary Payton II, so as Monique Payton strutted the basement hallway of Gill Coliseum Sunday afternoon telling everyone within ear shot, “We’re calling him ‘The Thief,’ O.K. ?” in reference to her son’s 17-point, five-steal, four-assist night, Payton II just nodded along. “We’re gonna roll with that,” he said. From a young age, Payton II’s parents encouraged him to figure out what he wanted and go get it without hesitation. It’s a lesson he applied first on kids courts. “I wasn’t really an offensive threat, so the only way I could score was if I went and took the ball away,” he said. Now it’s applied in the Pac-12, where the son of the best player in program history leads an Oregon State basketball resurgence one year earlier than expected. The Beavers are 14-0 at home, have a win over Pac-12 power Arizona and Wednesday night will try and go for their second win over UCLA. 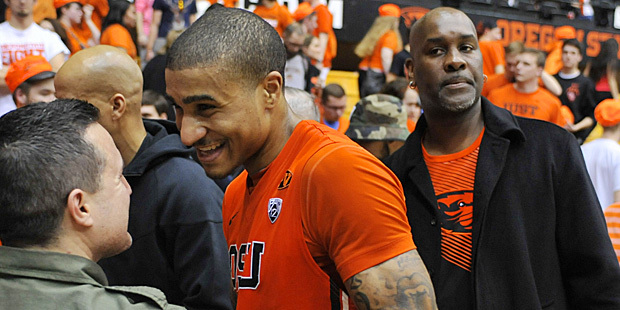 Oregon State hasn’t swept the Bruins since 1988, the sophomore year of the elder Gary Payton. Life in the shadow of a famous father can be exhausting and occasionally come with unflattering comparisons. In his prime, Gary Payton Sr. was known as “The Glove,” a moniker bestowed upon him for his abilities as a lockdown defender. His son, a junior college transfer from Salt Lake City, showed up to Oregon State last fall and told everyone there would be no similar nickname for him. “The Mitten,” would have to go. Cuddly, cozy adjectives will not be attached to her son. “The Thief” is more intimidating and fitting for the Pac-12 leader in steals. And according to Gary Payton Sr., it’s also where the resemblance stops. They have the same name, but different games: Payton Sr. was loud and cocky, jawing at opponents, officials and fans. Payton II covers his mouth when he talks trash, conscious of “staying on the refs' good side.” Payton Sr. controlled opponents on both ends of the floor, a well-rounded offensive option. Payton II likes the dirty work; he averages a team-leading eight rebounds per game, even though he’s only 6-foot-3. Still, he is usually Oregon State’s best player. He has proven to be a reliable scorer, leading the team with 12.7 points per game. He has terrific body control in the lane and can finish at the rim through contact. And he still has that knack for getting the ball himself, hence his 2.96 steals per game, best in the conference and third-best in the country. Given the lack of offensive talent, this team has to love defense. Picked to finish last in the Pac-12 preseason poll, the Beavers find themselves 1.5 games out of first place because of a balanced mixture suffocating man-to-man and zone looks. Under former coach Craig Robinson, Oregon State had a habit of giving up easy baskets. During his tenure, the Beavers defensive efficiency was never better than 97.2, and it dropped to 107.2 (215th in the country) last season. The Beavers ranked 10th in the conference in field goal percentage defense in 2013-14, allowing opponents to shoot 45 percent. With Wayne Tinkle at the helm, OSU now leads the Pac-12 at 37 percent, and its defensive efficiency is 89.1, eight best in the country. Tinkle inherited a roster bereft of talent—no returner averaged more than four points and the Beavers have seven walk-ons—but has convinced Oregon State it can win with defense. But before that, he had to convince Payton II to stick around. For all the negative press Robinson received in a six-year tenure in which he compiled a 94-105 record (39-69 Pac-12), he did two important things for Oregon State: He spearheaded the fundraising for a $15 million practice facility that opened in 2013 and reconnected with alumni who had soured on the program. Payton Sr., the Sports Illustrated 1990 player of the year and a consensus All-America, was one of them. Payton Sr. said that at first, Robinson didn’t think Payton II could play in the Pac-12. A non-qualifier out of Spring Valley High in Las Vegas, Payton II opted for a year at Westwind Prep, a college prep high school in Phoenix, to improve his grades and his game. Then he found himself at Salt Lake Community College. After watching Payton II lead Salt Lake to the NJCAA Division-I championship in 2013 and ’14, Robinson offered him. St. Mary’s and Arizona State were also in the mix, but Payton II liked the idea of leading the Beavers back to the NCAA tournament for the first time since 1990, when Payton Sr. was a senior. When OSU fired Robinson on May 5, Payton II thought about re-opening his recruitment. Outsiders considered Oregon State one of the worst jobs in the country, and said 2014-15 would be a throwaway season. Payton II didn’t want to play for someone already making excuses for why it’s tough to win in Corvallis. What he found was a coach who insisted the Beavers could surprise teams immediately. When the Beavers limped to a 16-16 season last year, Gill Coliseum was so quiet on game days that students could have done their homework in the bleachers. This community has a history of supporting hoops (the OSU women, ranked No. 8 in the country, lead the Pac-12 in attendance) and Tinkle found the job appealing because of the tradition, dating back even before Payton Sr.'s playing days. That support is creeping back. On Jan. 11, when the Beavers held on for a 58-56 upset of then-No. 7 Arizona, fans rushed the court. Sunday against Washington, when Payton II hit a 16-foot baseline pull-up jumper and got fouled right in front of his father, Payton Sr. had to cup his hands around his mouth and shout to be heard above the roar of a season-high 9,114 fans. Payton Sr. resides in Vegas, and travels to almost every Oregon State game. It’s impressive considering that just a few years ago, Payton II didn’t want his dad on the sidelines. Payton Sr. obliged, but would get game reports from Monique. When Payton II got home, father and son would sit down for a postgame critique, a ritual they still share. Even after Payton II recorded the second triple-double in school history with 10 points, 12 rebounds and 10 assists in a 71-43 blowout of Grambling State on Dec. 15, Payton Sr. had a few nitpicks. Turnovers needed to decrease and attacking the rim needed to increase. As the only other triple-double holder in OSU program—26 years and 778 games separate their feats—he felt uniquely qualified to give his input. But there’s one father-son custom they don’t share, and Payton II uses this news as an opportunity to trash talk. And if the wisest person in the family were making a bet, money would be on the younger Gary.